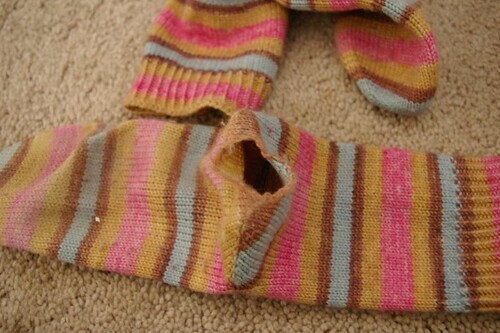 Hole in sock- sad :-(. But proof that they were loved. New ones look great. How about a super soft cotton boucle baby blanket? Let the yarn do all the work for you. Mindless sock pattern really depends on how mindless you want. I tried Primavera last week and it was tooooooo boring. I’m doing Spring Forward now. Love all the colors in the new socks. A few socks back, I knit my plain vanilla sock but did a broken rib up the leg. It was different enough to be interesting but was still mindless enough that I could take the socks to Knit Night. Of course, my idea of interesting and mindless is likely a lot less than your’s since I have a lot less experience following stitch patterns. I find that my heel flap socks last longer than my short row heel socks too. But I knit so many socks I have a hard time worrying about them wearing through!!! I’m late to the party but wanted to say a Huge CONGRATULATIONS! 🙂 I was wondering where you had disappeared to but was in the midst of a move myself as well! Glad to hear that you are starting to feel better and your bump is so cute! And the vest? 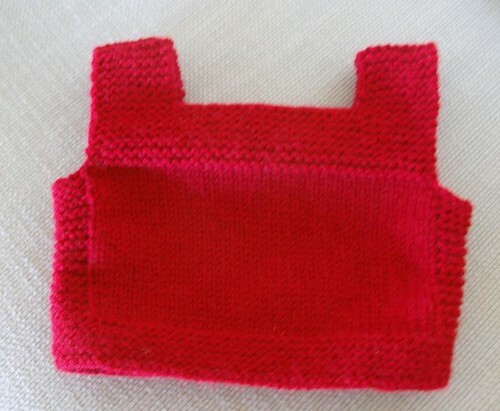 it makes me want to make one to save for my future child…so adorable! Love your new socks. They look so cozy and warm…. Glad to see you got your knitting groove back on!